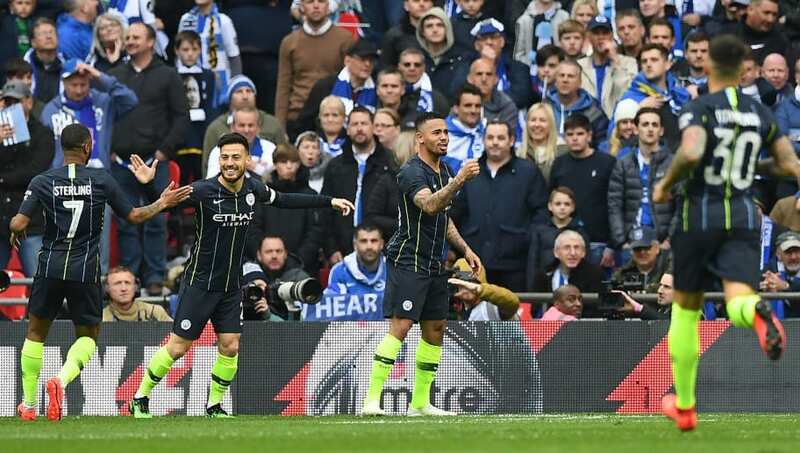 Manchester City advanced to the FA Cup final on Saturday afternoon, as they beat Brighton 1-0 at Wembley. City began in the best way possible, taking the lead after just three minutes. Kevin de Bruyne produced a beautiful cross into the box, as Gabriel Jesus dived in to head home and give the Citizens early control of the game. Pep Guardiola's side continued to dominate the game, but were unable to build on from their early lead. Meanwhile Brighton's chances were limited, as the Seagulls had just one shot on target all afternoon. Here's our take on this season's first FA Cup semi-final clash. ​Manchester City were absolutely dominant from start to finish, as they affirmed their control of the tie after just three minutes through Jesus' goal. Though the slim scoreline doesn't represent their control of the game, the Citizens were firmly in charge of Saturday's affair at Wembley. City didn't seem as ruthless as usual, shown by their sole goal. However their opponents were firm and stubborn in defence, and they still played well nonetheless. Guardiola's side worked hard throughout the 90 minutes, and deservedly progressed to the final. The win also keeps City's hopes of a historic quadruple alive, as they continue to compete for the Premier League and Champions League. It has been a wonderful season for the Citizens, as they moved one step close to their second piece of silverware. Starting XI: Ederson (6); Mendy (6), Otamendi (6), Laporte (7), Walker (6); De Bruyne (7), Gundogan (6), D.Silva (6); Sterling (7*), Jesus (7), B.Silva (6). Substitutes: Danilo (6), Fernandinho (6), Stones (6). STAR MAN - It was ​Gabriel Jesus' goal that secured the win for City, as he scored a trademark striker's goal. The Brazilian took his chance in the absence of ​Sergio Aguero, and was outstanding on City as he was the match winner at Wembley. ​Brighton were so close to reaching a historic cup final, but fell just short as they were deservedly beaten by one of the best teams in England. They were dominated and were second best all afternoon, but they can certainly be proud of their efforts. For a club fighting to survive in the Premier League, it is a remarkable achievement for the Seagulls to reach the final four of one of the world's most prestigious competitions. They had good periods of the games and some big chances, but were fairly beaten in the end. It brings an end to a memorable cup run for Chris Hughton's side, but they should certainly be proud of themselves. It was a valiant effort from the south Coast side, who bow out of the FA Cup in a season to remember. Starting XI: Ryan (7); Bernardo (6), Duffy (6), Dunk (5), Montoya (6); Propper (6), Stephens (6); Jahanbakhsh (5), Bissouma (7), Knockaert (7*); Murray (5). Substitutes: ​Andone (6), Izquierdo (6), Locadia (N/A). STAR MAN - Despite defeat Brighton had many outstanding performers, including Anthony Knockaert. He led every Seagulls attack, worked tirelessly all game and put in an immense shift as he certainly stood out on Saturday. Manchester City will now play in their 11th FA Cup Final, which will be played on 18 May. They will meet the winner of Sunday's second semi-final tie, with ​Watf​ord or ​Wolves awaiting the Citizens next month. Manchester City continue their pursuit of a historic quadruple next week, starting with their ​Champions League quarter-final at ​Tottenham on Tuesday. They return to ​Premier League action next Sunday, returning to the capital for the third game in a row to play ​Crystal Palace. Brighton have two home games in the league up next, starting with the visit of ​Bournemouth next Saturday. The Seagulls are back at the AMEX once again midweek, hosting relegation battling ​Cardiff City on 16 April.